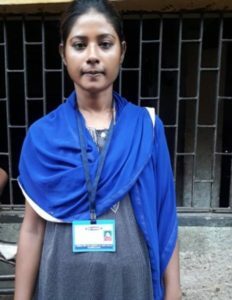 Mumtaz Khatun, a 24 years old woman of Ward-59 under Park Circus, has played a significant role in keeping her community clean and mobilizing the community to sustain the initiative. She had a deep desire to change the environment in which she had grown up. During her growing years she had continually witnessed the filthy environment and the contribution of not only her neighbours but also her own parents to make it worse day by day. Through her own personal experiences and by observing others, she keenly felt the need to spread awareness among her neighbours and at the same time she knew nobody would heed her words. ‘I live in a very congested slum but a few steps ahead there are many multi-storied building with a shiny look which infuriates me. I dreamt of having such an environment for my community. “One day I was talking with my friends in front of my house when a woman came up and requested me to attend a discussion. I was curious to know what she would say and attended the meeting. That was the real beginning of the fulfillment of my childhood desire to live in a clean environment. I found a platform to reflect, learn, lead and take bold initiatives and resolve to steer my life in a direction that would create change my community”. As a member of Community Management Committee (CMC) she played an important role to gather community, doing exercise on identifying sanitation related issues, resolve the issues that can be done by the community itself, managing the services, and demanding better services from service providers. “As a member of task force we have been given responsibility to ensure better sanitation services and managing existing sanitation facilities throughout the ward with active support of CMC members. We are using basic guaranteed tool to make the Task Force participatory. We are thankful to councillor and ward committee members for extending their full cooperation to this process. We are conducting monthly review meetings and take stock of overall sanitation situation in the ward. Till date we conducted two such review meetings. Prior to the onset of the monsoon we organized a cleanliness drive across the ward, at four different spots. We also ensured regular cleaning of Community Toilet and waste collection at door step as well as from the waste collection enclosure. “As a CMC member I have learnt a lot of things not only from CFAR Didi but also from community. Whenever I discussed something in the community I get really useful opinions and views which I didn’t consider before.”- she said. The story of Mamtaz Kahtun is just one example of how women are weaving the social fabric and strengthening the community participation alongside their amazing ownership development.